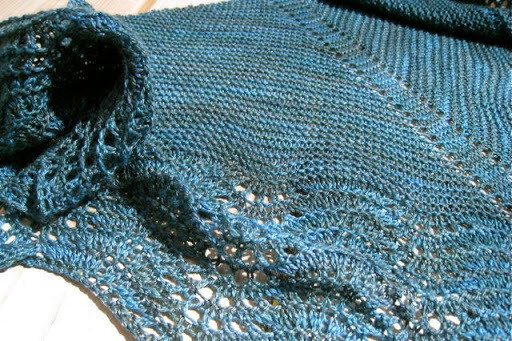 When it was time to cast off the last stitch of my third Multnomah, I knew I was ready to move on. 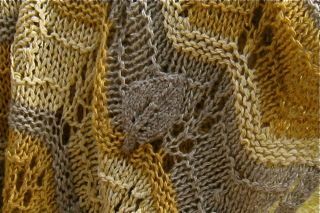 I love this pattern, though, and I know I’ll make it again. And knitting with the beautiful Spirit Trail Nona — a blend of merino wool, cashmere, and bombyx silk — was like a dream. The color is a special one that Jen dyed just for me. 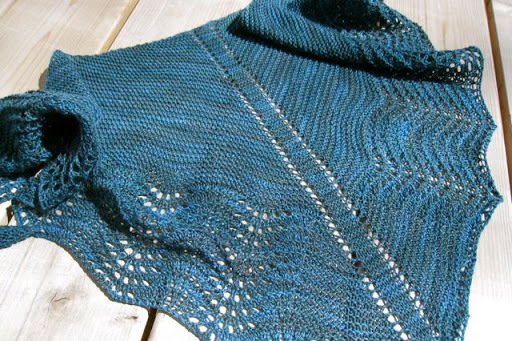 Today has been lovely and warm —a day to spend time in the sun — but I almost wish it was chilly enough to wrap this little shawl around my neck! Sometimes old knitting comes back into your life. Sometimes it’s welcome, sometimes it’s something you hoped you’d never see again. This blanket fits into the first category. I made it for my niece, so long ago that I don’t remember when. I recognize some of the yarn, but not all. It needed some repair, because it turns out that she loves it and uses it every day, so she brought it to me when we were together last month. See the leaf in the middle? I knit two, one for the front and one for the back. I positioned them over the hole, which was pretty shredded, and sewed them together. I think it works! I mailed it to her the other day, and I can’t wait to hear what she thinks. I’ve moved on to other projects — right now it’s a simple ribbed hat for a gift, using some Bijou Spun Himalayan Trail, which is yak and a little merino. Then I might get back to my cardigan. Or not. Whatever I have on the needles, it’s keeping me sane. Ohhhhh beautiful!! And the leaf works even better than I was picturing it. The leaf is inspired! it looks like a special little artsy detail – nobody would guess it was a patch. I see the ocean in the blue yarn. A great way to mend a blankie! It looks to me, as though the leaf fits there, so I would say your "repair" worked very well indeed. How nice that she loves it so much to wear it thin in places. A true testament of her appreciation. :)The Multomah looks gorgeous. Like you, it's a favorite pattern of mine as well. I love the blanket patch. 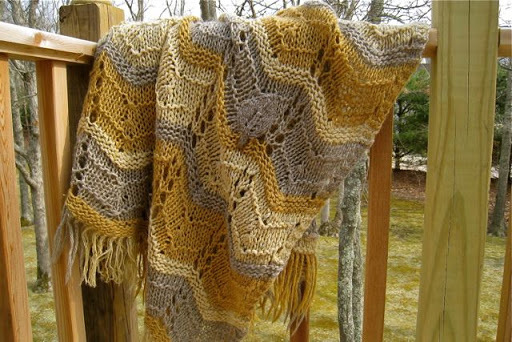 I will file this away for future use ;)Lovely shawl. First of all, how wonderful that a gift knit is so loved and appreciated. And secondly, what a terrific fix! Truly inspired. How clever. Lovely. And I'm going to remember that "fix" — because it's pretty darn perfect! Love the leafy patch! 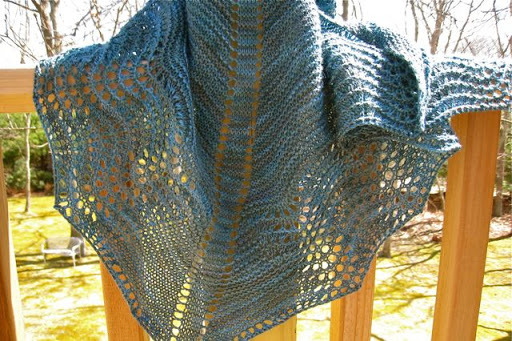 The color is just fabulous on your latest Multnomah! The leaf patch is a very clever idea! The blanket is lovely, and how great that it's so loved and appreciated. Beautiful Multnomah!